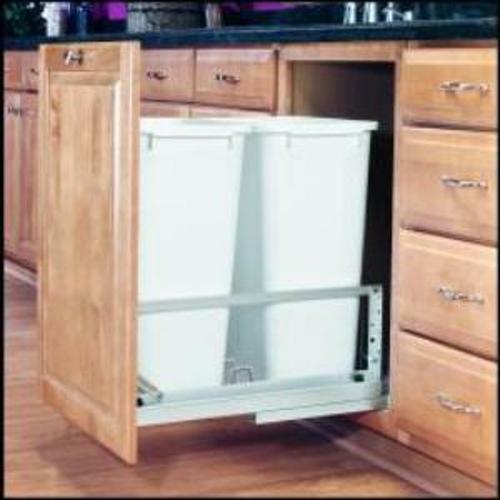 OVISonline.com offers Rev-A-Shelf soft close trash cans and Rev-A-Motion pull-out waste containers in many sizes. Finishes & Colors include: White & Sliver. Top mount and bottom mount are common mounting styles. Soft Close is standard on all these models. 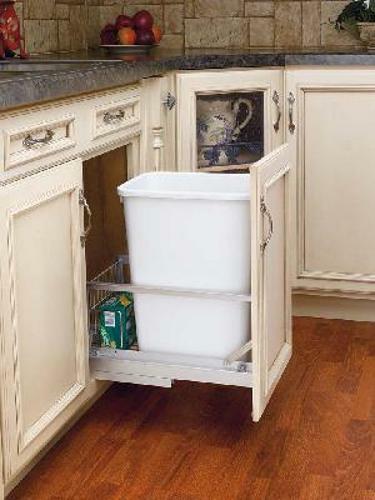 Rev-A-Motion 4WCBM Series Trash Can features a Soft-Open/Close System. Single 50 Quart with Metallic Silver polymer cans. 150 lb. Concealed slides. 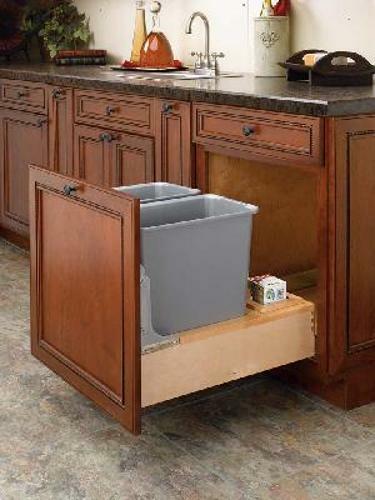 Rev-A-Motion 4WCBM Series Trash Can features a Soft-Open/Close System. Singe 35 Qt. With Metallic Silver polymer cans. 150 lb. Concealed slides. 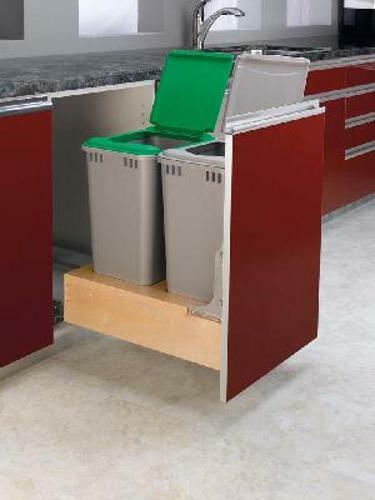 Rev-A-Motion 4WCBM Series Trash Can features a Soft-Open/Close System. Double 35 Qt. Metallic Silver Polymer cans. 150 lb. Concealed slides. 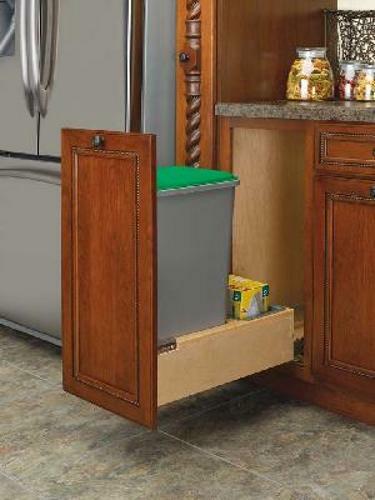 Rev-A-Motion 4WCBM Series Bottom Mount Trash Can features a Soft-Open/Close System. Double 50 Qt. Metallic Silver Polymer Cans. 150 lb. Concealed Slides. 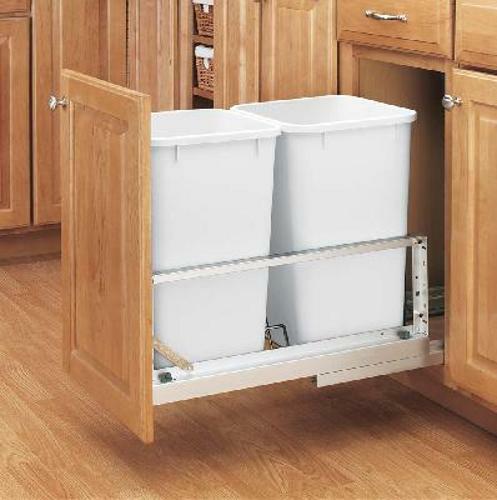 This is the Ultimate in narrow Pull-Out Trash Cans, featuring two 27-quart molded polymer containers for Base 15 cabinets -. Full-extension, aluminum slides and door mounting system. 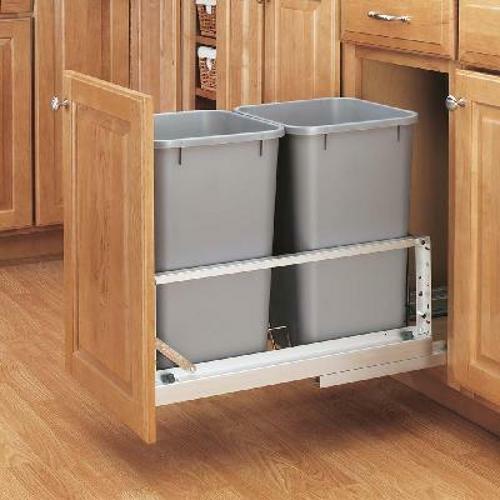 This is the Ultimate in narrow Pull-Out Trash Cans, featuring two 27-quart molded polymer containers for Base 15 cabinets - Full-extension, aluminum slides and door mounting system. 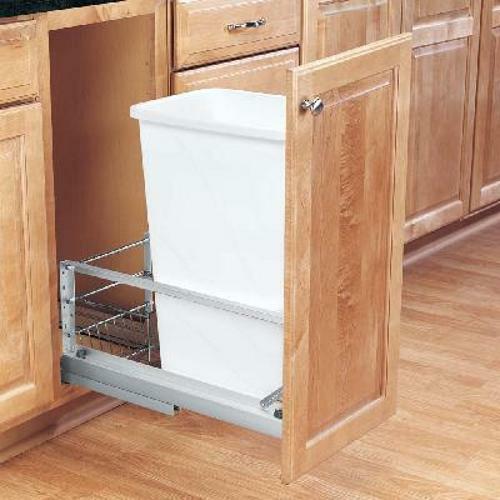 The ultimate in pull-out Trash Cans feature full-extension, heavy-duty brushed aluminum slides with ramp-in self-closing, heavy-duty wire frame for supporting the containers and a door mounting system. 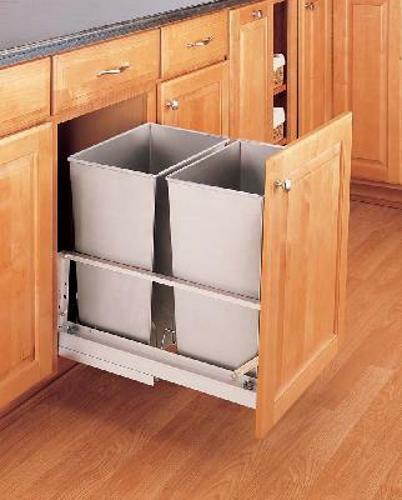 The ultimate in pull-out Trash Cans feature full-extension, heavy-duty brushed aluminum slides with ramp-in self-closing, heavy-duty aluminum frame for supporting the containers and a door mounting system. 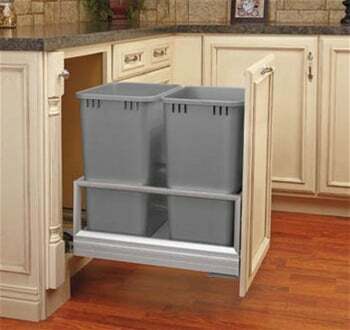 This is the Ultimate in Pull-Out Trash Cans, featuring one 35-quart molded polymer containers with full-extension, heavy-duty aluminum slides. Door mounting system with ramp-in self-closing. 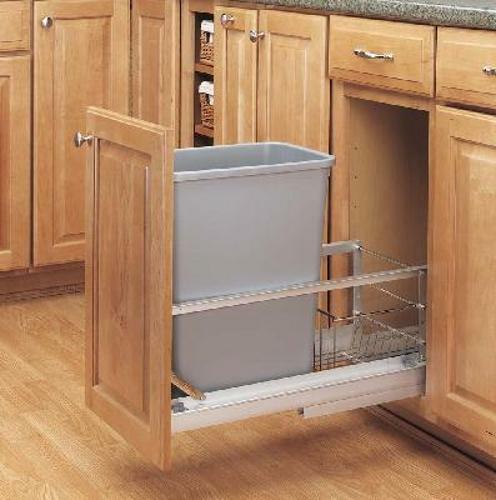 This is the Ultimate in Pull-Out Trash Cans, featuring one 35-quart molded silver polymer container with full-extension, heavy-duty aluminum slides. Door mounting system with ramp-in self-closing. Single 32 Qt. 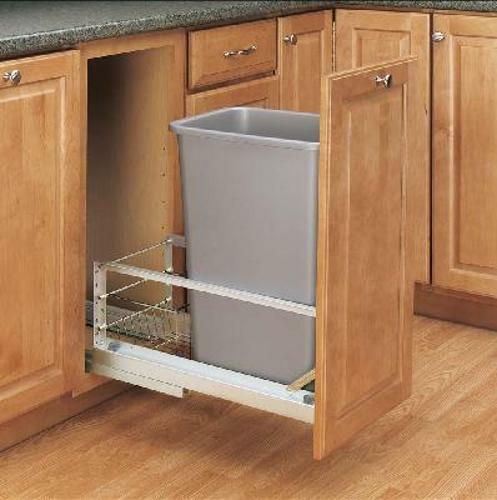 Stainless Steel Trash Can Unit (18" Depth) A Trash Can you're not ashamed to show your friends. Brushed aluminum frame with chrome wire supports, stainless steel containers...if only your garbage looked this good! 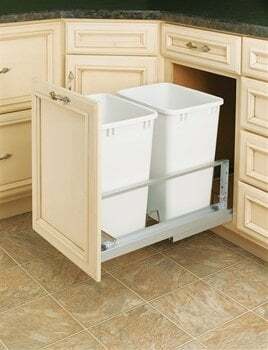 This is the Ultimate in Pull-Out Trash Cans. Special 18" shallow depth. 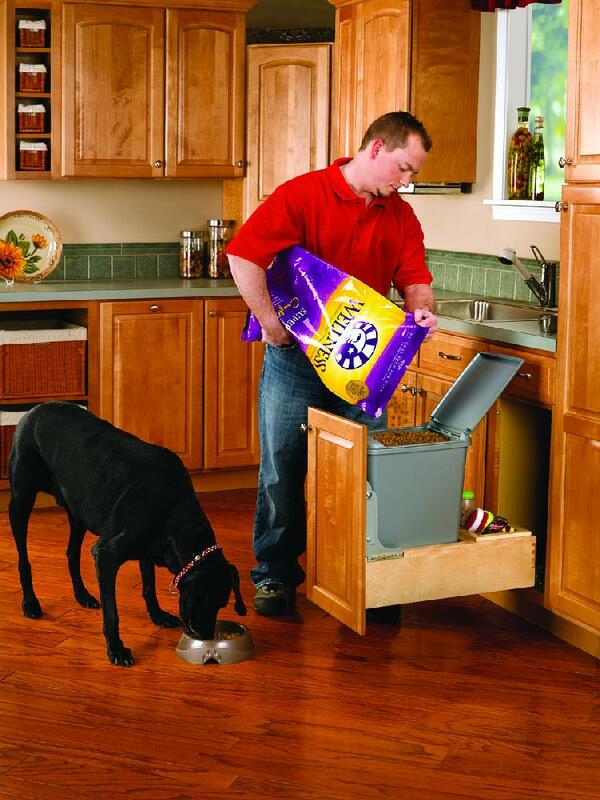 Featuring one 35-quart molded polymer containers with full-extension, heavy-duty aluminum slides. Door mounting system with ramp-in self-closing. 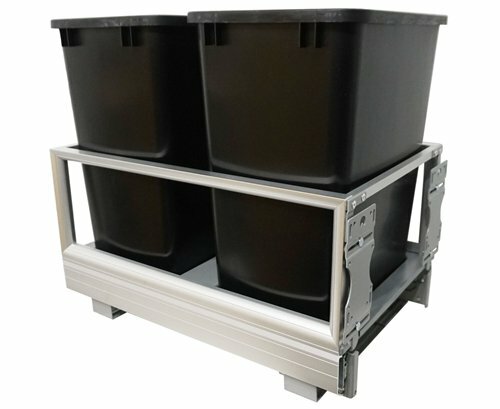 This is the Ultimate in Pull-Out Trash Cans, featuring two Metallic Silver 35-quart molded polymer containers with full-extension, heavy-duty aluminum slides. 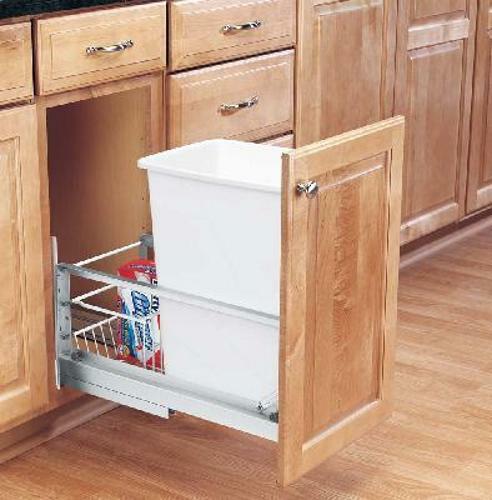 Door mounting system with ramp-in soft-closing. Finally! A Trash Can you're not ashamed to show your friends. 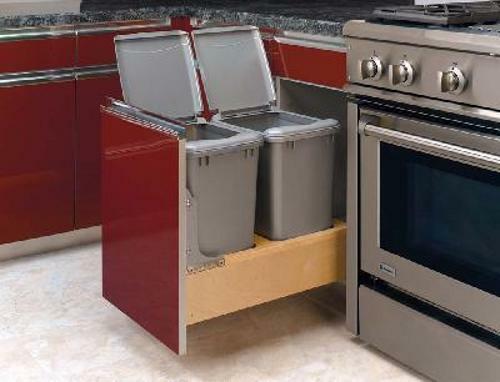 Brushed aluminum frame with chrome wire supports, stainless steel containers...if only your garbage looked this good! 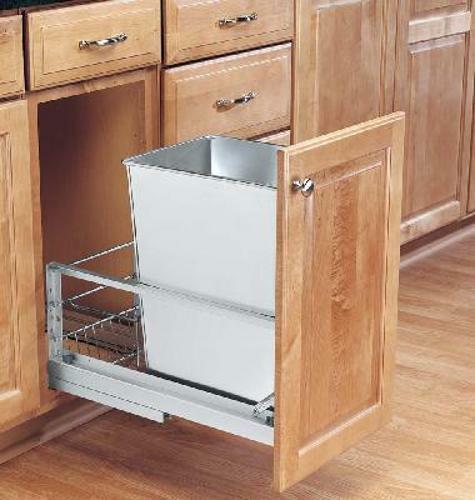 The ultimate in pull-out Trash Cans feature full-extension, heavy-duty brushed aluminum slides with ramp-in self-closing, heavy duty wire frame for supporting the containers and a door mounting system. Beautifully finished with a clear coating to preserve the woods character and allow an acceptable match to nearly any cabinet. 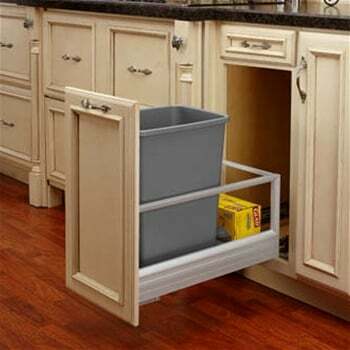 Single 35 Quart Pull-Out Waste Container, Metallic Silver with Rev-a-Motion Soft open/soft close slides. 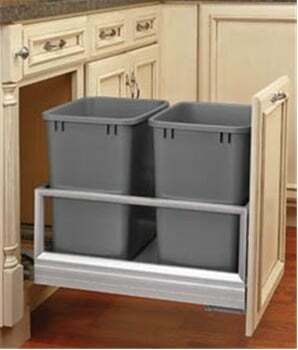 Double 35 Quart Pull-Out Waste Container, Metallic Silver with Rev-A-Motion Soft open/soft close slides. 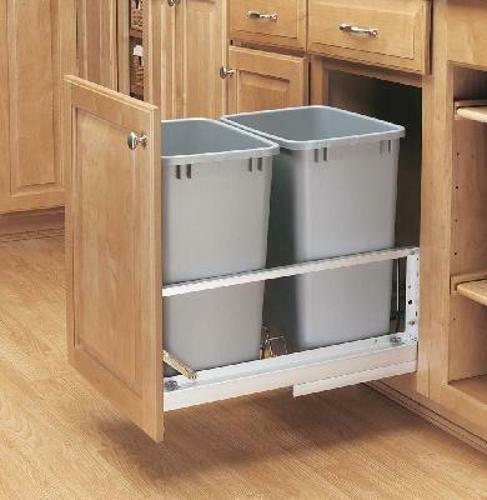 Double 50 Quart Pull-Out Waste Container, Metallic Silver with Rev-A-Motion Soft open/soft close slides. 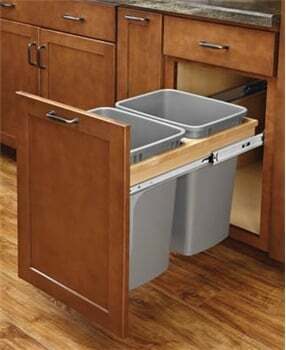 Double 35 Quart Pull-Out Waste Container, Black with Rev-A-Motion Soft open/soft close slides.